C’est parti pour le concours européen de dégustation de produits laitiers à l’ENIL de Mamirolle. Nous accueillons des écoles venues des 4 coins de l’Europe qui vont en profiter pour découvrir notre belle région de Franche-Comté. We are very happy and very proud to welcome the Europel Contest this year. You are in the heart of Franche-Comté region. We hope you will enjoy discovering our region, the territory and tastes and our school with its rich history. Tradition, know-how, courage of the men and women of the rural world have shaped the landscape and have forged the characters. 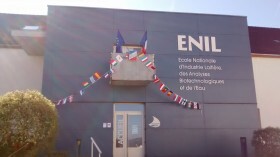 The workshops of the ENIL produce Comté and Morbier, but also other cheeses, yoghurts and fresh products. Our students have the opportunity to perfect their theorical knowledge with trainings in company conditions. Our school also diversified in the fields of biotechnological analysis and water management. They are expanding domains for the future. We are happy to help you, the young people, to discover our education system, our products and our region. We hope you will share this experience of meeting others in new surroundings for many years to come. It was 25 years ago that EUROPEL was founded, and still we are grateful to Mr. Mathieu who took the initiative. The goal of EUROPEL was to improve contacts between dairy teachers and students from several countries, to learn from each other and exchange information and knowledge about Dairy and Dairy Industry. Since then several meetings were organized where new developments in Dairy Industry were presented and discussed, where teachers informed each other about study programs and several projects were done. Also students took part in these meetings and they competed in the Sensory Contest for Dairy Products. Of course this competition is important, and it’s an honour to win a price. But it is also important to be a participant, taking part in this unique event. To learn about products in other countries, to share experiences and to make new friends. This year we are invited by “Mamirolle”, where we can learn about the products from this beautiful region in France, and taste them as well! We thank all the people who are involved with the organization of this event and hope that everybody will enjoy these days, and of course the 25 th anniversary of EUROPEL.